Director of The Om Space, Serena’s discovery of yoga began with a chance encounter with a teacher who inspired and supported her. 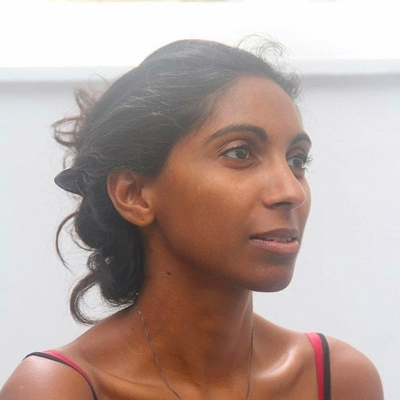 The practice has been nourishing her ever since!Serena Qualified as a British Wheel of Yoga teacher in 2005, and she has been teaching professionally in London and in Colombo since then. She is also qualified to teach Yoga for Pregnancy and Yoga for Children both of which she is currently practicing at The Om Space. Serena established The Om Space as Colombo’s first dedicated yoga studio in 2013, mainly out of a desire to build a healthy and supported yoga community in Colombo.Serena believes that the practice of yoga improves life from both a happiness and a health perspective. Serena and The Om Space teachers and therapists have spent much time with the Aryuva team, introducing us to yoga a few years ago and more recently to alternative therapies. Ayurva is delighted to have Serena on board as she will contribute towards Ayurva by introducing the benefits of yoga and other alternative practices to our clients. Yoga is about frame of mind and attaining the right postures, if a person wants to learn there are no restrictions, except maybe injury; and if that's the case, you can work around the area and treat it with therapeutic yoga.